Gay teenager Hart could finish his fairy tale for class if his horrible stepsiblings would stop harassing him. Talia’s depression is like a sleeping curse and may kill her if she doesn’t ask for help. Independent, overweight bisexual Sienna deals with her “nice guy” neighbor while visiting her grandmother. When a mysterious girl climbs up Rachael’s fire escape, Rachael might finally break free from her overprotective mother. Transgender Amelia is bullied regularly for her identity, but she’ll show everyone exactly who she is. Princess Rellyn must face down a dragon since she’s seventh in line and battle her father since she’s not a boy, and she’s not sure which one is scarier. An adventurous knight whisks away genderfluid Noll when all they want is a quiet life on their farm. Mermaid Astrid wants revenge on the man who betrayed her, but is confused by her attraction to the one sailor immune to her song. Asexual Myka might love Princess Lysandria, but Myka must learn to control her inner werewolf before the king marries her off to “cure” her. With the help of a witch, blacksmith’s apprentice Malcolm must find his missing prince. 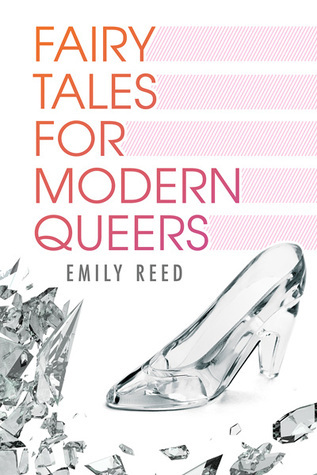 These are short – sometimes way too short – little LGBTQ takes on the old fairly tales. In each there is a character or character that falls into that community who takes on a more modern/unique role. Each story is a different set of people, using an old fairy tale as a template for a modern story. The writing is good. The idea is magnificent. I really think that for the YA audience these will really ring true and find a home in the heart of the LGBTQ YA community. However, for me, it felt like just as I was invested in the story – it ended. So it was a little off-putting and frustrating. I’d like to see these stories more fleshed out, I definitely think there is more that they have to offer. I really liked that it wasn’t just gay or trans but a variety of gender roles/sexual orientations. There really is something for everyone in this anthology. Overall, I give it high points for the attempt with a little bit taken off for brevity. If you are a YA fan I’d give this a try, it really is remarkable. This entry was posted in asexual, bisexual, Contemporary, Disabled, dystopian, ebook, Exploration, f/f, Fantasy, Gay For You, Hurt/Abuse, m/f, m/m, magic, merfolk, non-binary gendered, Paranormal, Shifters, Trans, vampires, Young Adult on March 26, 2015 by Morgan.